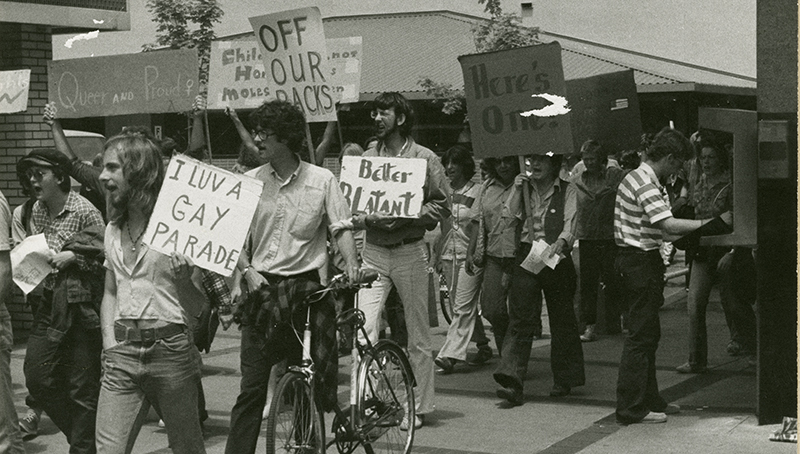 Members of the UO’s LGBTQ community have long been innovative and pioneering agents of change. In 1969 — the same year as the Stonewall Riots in New York — UO students founded the Gay People’s Alliance. It was the first organization for homosexuals at a West Coast university and one of few such organizations to be recognized at that time as an “official” student group and receive university funding. From this starting point, “Creating Change” traces the history of LGBTQ struggle for inclusivity, equity, and community up to the present day. The exhibit includes an annotated timeline, archival document scans, historical newspaper articles, photographs and more. Included are profiles of LGBTQ campus leaders Randy Shilts, Lynn Pinckney and David Funk, and exhibits on traditions and special events like Blue Jeans Day and Campus Coming Out Day. The original, analog “Creating Change” exhibit was organized in 2012 to commemorate the 20th anniversary of the Standing Committee for LGBT Concerns at the UO. It was displayed at Eugene Airport. Since the creation of the Campus Climate Index in 2001, the UO has been consistently rated among the top 25 most LGBT-friendly college campuses in the nation. More recently, it was recognized as one of the top 10 trans-friendly colleges and universities.